I just want to share how to lossless backup Blu-ray movie to HiMedia 900B retaining multi-track on Mac OS X 10.9 Mavericks, so that you can free watch Blu-ray movie on TV via HiMedia 900B. HiMedia 900B is a conventional specialist Media Player which supports all file formats including 3D movies. With it and a HDMI cable, you can watch most videos on TV without format problems. Although it supported Blu-rays natively, it’s still not a good idea to take out Blu-ray discs frequently due to scratch issues. Also, as I own a large collection of Blu-rays, I also built a home NAS with large storage, so the file size is not the case. Like I said, generally I just want a tool that can backup Blu-rays to MKV without quality loss on Mac. So I started to search online for an ideal tool. However, it’s rather disappointing that most ripping software simply compress my Blu-ray to MKV container format with codec like H.264, AVC, ect., the converted video is downsized which doesn’t work for me. 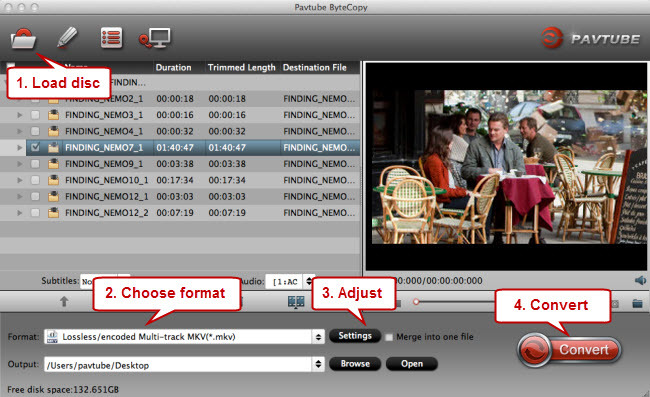 At last one of my colleague recommended Pavtube ByteCopy for Mac and wow, it works like a charm! It’s so easy to use, converts very fast and output lossless videos. Mac OS X 10.9 Mavericks, 10.8 Mountain Lion, 10.7 Lion, Snow Leopard 10.6. Surprise! Share Pavtube New Year Sales to Facebook to get 20% off any products. This program also has a Windows version which works for Windows 8.1/Windows 8/Windows 7/Windows Vista/2003/XP find the ByteCopy (windows) here. How to lossless backup Blu-ray to MKV for HiMedia 900B and keep multi-track? Step 1. Launch Pavtube ByteCopy and load disc. Firstly you need an external blu-ray drive; there’s no special requirements of the drive model as long as it’s supported by your Mac. Click the top left icon and it will detect the inserted Blu-ray disc, click disc name to load them. Step 2. Choose lossless format. 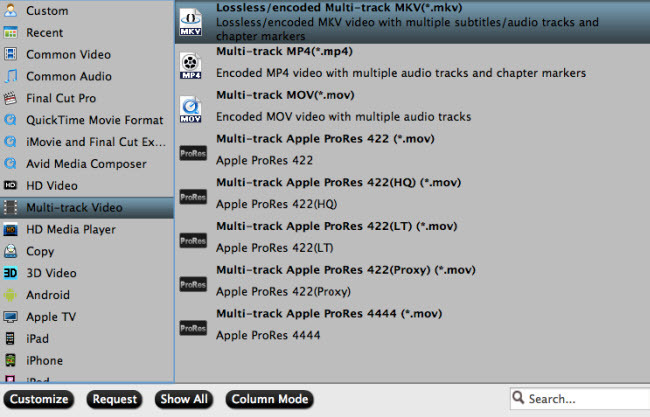 Click “Format” list and select “Multi-track Video>Lossless/encoded Multi-track MKV(*.mkv)” as below. Step 3. Adjust V/A settings. 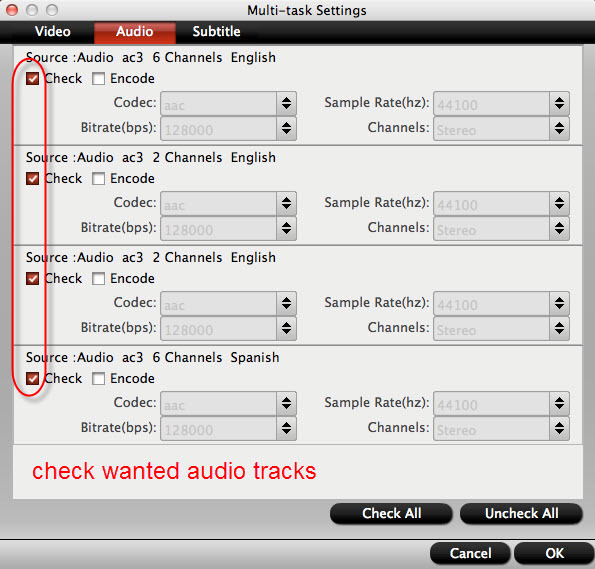 The switch to “Audio”, check wanted audio track; so does the “Subtitles”. Click the big “Convert” to start the conversion. It takes about 40 mins for my Macbook to backup a Blu-ray disc, but the conversion speed also depends on your computer configuration. My suggestion is not to play or edit videos when it’s converting. After conversion, click “Open” or “Open output folder” to quick locate converted files. Ok now the lossless MKV files are prepared; transfer them to your hard drive and connect it to HiMedia, now you can enjoy Blu-ray movies on TV without quality loss!